Planning a trip to beautiful Greece? Read here everything you need to know. 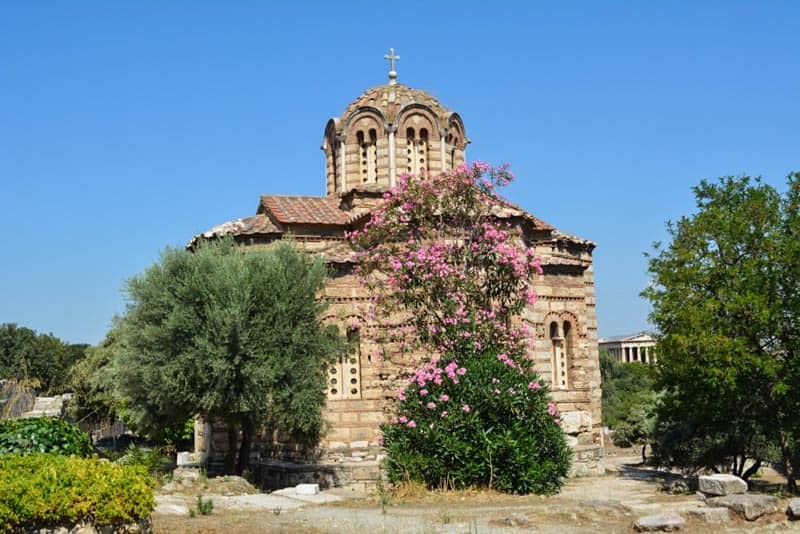 In this Greece Travel Blog Post you will find quick overview and lots of information on when to go, what to do, why you should go and what to expect. Greece is one of the most popular tourist destinations in the world, and what is not to love? From romantic islands to great food, to wonderful people and a rich heritage, Greece has so much to offer that you will be spoilt for choice. Geographically located on the crossroads of Europe, Asia and Africa this country will surprise you with the multitude of sights, sounds and tastes. Enjoy the good life on a balmy summer night with a glass of sweet red wine, visit the ruins of some of the most famous Western archeological sites (or a more recent medieval site for that matter! ), or have fun on the water – Greece got you covered. 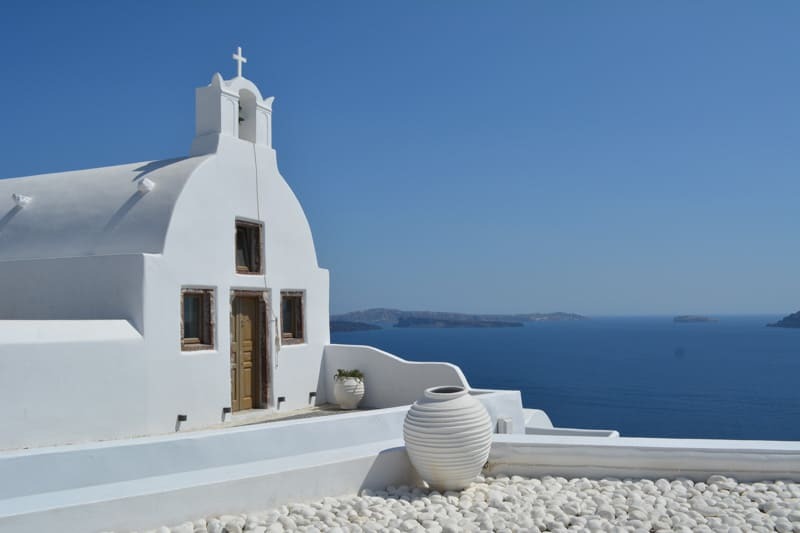 A country of white and blue – Greece’s iconic landmarks are world renown. Here: The pretty windmills of Mykonos. Greece is a typical Southern European destination. Hot summers and mild winters make this country a year-round attractive destination, but of course summer is the time when most beaches, tourist spots and ancient sites will be overloaded with tourists. Greece is popular with families and the LGBT community, with retirees and thrill-seekers, with honeymooners, party people and celebrities. Cruise ships love the fact that many destinations are conveniently close to ports and that Greece offers more than 1,200 islands to choose from. Greece is considered the cradle of Western civilisation. People inhabited the area since the beginning of time, but the current culture as we know it today is dated from 4,400 years ago. Many civilisations have fought over this region over the centuries, including the Greeks themselves, so this, together with the culture blossoming of the classic period, forms the basis of countless ancient sites that can still be visited today. Greeks count an impressive 18 UNESCO heritage sites their own, including of course the Acropolis of Athens, Delphi and Ancient Olympia. Santorini is a popular cruise port and honeymoon destination. Popular travel destinations in Greece include the big cities such as Athens (the capital city) with its cruise port of Piraeus, ancient sites such as Olympia, Meteora (where Byzantine monasteries are perched on high monolithic cliffs), and Delphi, holiday and party islands such as the Ionian islands (including Corfu and Zakynthos Island with the famous Navagio Bay), and the typical picture-perfect Cyclades like Santorini and Mykonos where you will find the famous white-washed houses and blue-domed Orthodox churches. Greek food needs to have a dedicated paragraph in this write-up. Heavily influenced by other Mediterranean cuisines, Greek food is a rich and varied culinary experience, so very different from what you would get at a Greek restaurant anywhere in the world. Vegetables, herbs and salad are as much part of the traditional Greek diet as are seafood and fish, chicken and lamb. Greeks like to keep it simple with dips and bread (tsatsiki, for example), olives and feta cheese. Olive oil is a serious affair in this country, with retailers offering you little shot glasses to sample your preferred flavour. Greek wine is legendary thanks to the warm climate, and a night out without a glass of ouzo or raki is simply unheard of. For breakfast, try spanakopita (spinach pie) which you can wash down with a traditional strong and thick Greek coffee. Greece is the perfect country to combine relaxing hours by the beach with a little bit of culture. The question should rather be, what not to eat. Greek food is simply amazing but you do need to like olive oil. Try any kind of fresh seafood, fish with skordalia dip, souvlaki, moussaka (a bit like lasagna but with potatoes and eggplant), and the heavenly sweet baklava. Koulourákia is perfect for on the go: a sesame sprinkled twisted bread. There are some really naughty souvenirs that you can buy in the tourist shops, if that’s your thing! Homosexuality did have its place in ancient Greece, and the things that you can buy in the shops may make you blush. If you want to play it save go for the famous evil eye that you will find everywhere in Greece. It’s a pretty blue stone with a blue eye on it, usually glass, that is supposed to ward off the evil eye. You will find it in all shapes and sizes and it is probably the most typical thing to bring home after a holiday in Greece. With so many to choose from, don’t ask me, ask the people. People’s Choice Awards have nominated the best 3 beaches in Greece, in this order: Elafonissi in Crete (which has pink sand, figure that! ), Porto Limnionas (on Zakinthos), and Balos Beach in Kissamos. There are many more to explore, but this is a good starting point! Corfu is just one of many holiday islands in Greece. Visitors can expect crystal clear waters and picturesque coves. Depending on what type of holidays you want to experience you need to cater for the activities you are going to plan for your stay. Swimmers are generally a good idea, there is always plenty of opportunity for a quick dip, and sun protection in particular in summer is a must. When visiting religious sites like the Byzantine Monastery of the Virgin in Corfu make sure you dress conservatively so that you don’t offend anyone (i.e. covered shoulders and knees preferably). Non-slippery shoes can be a good idea if you are in one of these mountainous old towns that require you to navigate many steps and steep inclines on slippery stone surfaces. I know it sounds counter-intuitive but don’t visit Greece in summer if you can avoid it. First of all, Greece can be tragically hot to the point that you don’t want to move anymore and are at risk of heat stroke and exhaustion. Plus, summer is peak season in Greece and you will need to share all the good sites with way too many other travellers. Trust me, a visit of the Acropolis in summer when the cruise ships arrive is no fun. Destinations like Santorini try to regulate the daily influx of visitors now but you will find that the romance is lost when you have to squeeze through masses of sweaty people in narrow old town lanes. Besides places like the Acropolis and the Plaka (old town) Athens proved to be a major disappointment. If you compare it to Rome you will be hard pressed to find any old buildings that impress with age and grandeur. Athens as well as the rest of Greece does have occasional earthquakes and over the millennia many buildings have been reduced to rubble by the violent quakes. Athens today has a lot of cheap building stock from the 60s and 70s that could quite easily be found in many other places of the world. What we did like in Athens though, was the Agora. We didn’t really like our experience on the Acropolis but the nearby Agora in Athens were a great alternative. In case you haven’t picked that up yet, it’s the food. That in combination with a culture that feels brotherly and inviting, a perfect day for me in Greece could be at a small table in a town square in the shadow of a church, surrounded by locals doing the same, consuming an endless row of simple yet tasty dishes which I would wash down with a good glass of wine or two. That’s the life! I don’t want to sound like a barbarian but I would love if Greeks could use the Roman alphabet. All these weird letters are making my head dizzy. I always feel slightly disoriented and helpless when I try to figure out which way to go, or what kind of business I have in front of me. Not that I would request them to change it for me, it is just something that I find slightly tricky. Also, less tourists would be good. It was almost impossible to even get on top of the Acropolis with all the other visitors present – at times it felt that we had been thrown in the middle of a rock concert. Greece is way too interesting to just spend your time on the beach. Do make sure you visit some of the ancient sites nearby, no matter how insignificant they may seem. If you do have the time, island hopping on the efficient Greek ferries is a great way to explore the country and its many different faces – Greece is more than just white-washed houses and blue-domed churches. And eat, eat, eat your way through Greece, you won’t regret it! Colourful wooden balconies and stairways in Mykonos – You won’t see them if you just stay on the beach! Click here to book accommodation on the Greek Islands with Booking.com. Disclaimer: I have and still use Booking.com for my own travel needs. There are a reputable company that I fully trust. If you click through the link provided to book your next hotel stay you will send a small commission my way. This will support the blog. Thank you very much!